Cosmic Hobo - ZineWiki - the history and culture of zines, independent media and the small press. 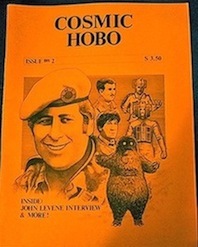 Cosmic Hobo was a media science fiction fanzine published by The Cosmic Hobos of Peterborough. Released in Peterborough, Ontario, Canada in the 1980s, Cosmic Hobo was devoted to the science fiction tv series Dr. Who. Four issues were published. It was first edited by Dean Shewring, then later by John Sigerson. The first issue appeared in 1983. It included the contributions "Children of Fire" by John Peel, and "The Ice Warriors: The Real Story", by Martin J. Wiggins. The second issue was released in 1986. It features front cover art by Martin Proctor, back cover art by Evelyn Farris, and illustrations by Philip Crawley, and Martin Proctor. Contributions of writing came from Pam Geiger, Eric Hoffman, Colin Jenkins, and Dean Shewring. Included was an interview with John Levene by Melanie Smallman. Issue 3 was published in 1988, and the last issue, #4, in June 1989. Dean Shewring had previously co-edited The Gallifrey Gazette in the 1970s. In the 1980s, he and John Sigerson were also editors of The Troughton Recorder, a newsletter devoted to the Dr. Who actor Patrick Troughton. This page was last modified on 3 September 2018, at 20:47.